2-3 medium zucchinis – slice into fettuccine noodles with a vegetable peeler or mandolin. If you have a spiral vegetable cutter, it will make beautiful spaghetti noodles! 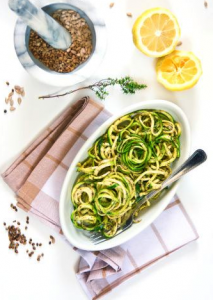 Scoop zucchini pasta into bowls and top with pesto sauce. Add in vegetables of choice to add flavor, color and texture such as olives, sundried tomatoes, mushrooms, artichoke and colorful peppers. Looking to get all the flavor and satisfaction from your favorite pasta but looking to cut out the calories and starch? 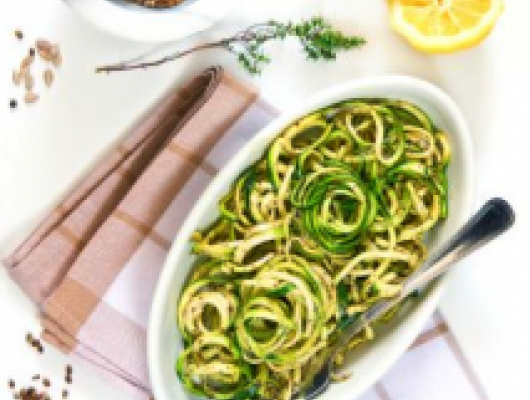 Eat all the pasta you want with this raw zucchini pasta! It’s easy, colorful, full of flavor and best of all, mega healthy! Leave the guilt behind and indulge in this yummalicious new way to make an Italian fave!